The leading Heat Gun in the industry! 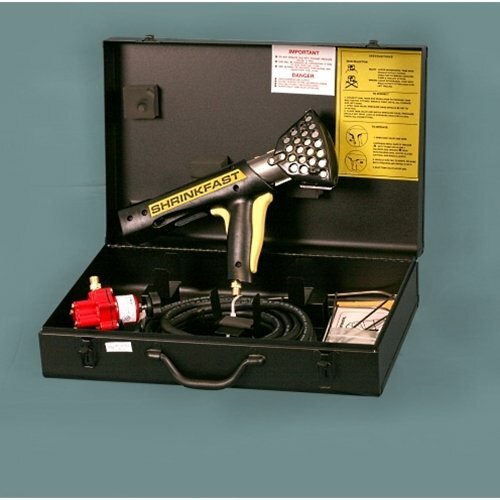 Our Shrinkfast propane fired Heat Gun Kit includes: 998 Heat Gun, Custom Carry Case, Auto Igniter, Regulator, 25' Hose & UL Guard (Made in the USA). We've added in a set of Quick Connects to make it easy to remove your heat gun from the propane hose and safely store it away. No need to keep using the wrench to loosen off and tighten back on!! If you have any questions about this product by Shrinkfast, contact us by completing and submitting the form below. If you are looking for a specif part number, please include it with your message.